Should You Buy a Boat or Go with Boat Rentals? Save money. 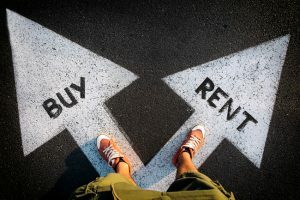 It might seem counterintuitive that renting can save you money, but it’s true in many cases. When you choose boat rentals rather than purchasing a boat, you avoid licensing fees, registration fees, the original large purchase cost, and maintenance and repair costs. Save time. When you buy a boat, you not only take the time to use your boat, but also the time required for repairs, maintenance, getting gas, and cleaning your boat up afterwards. Boat rentals enable you to boat when you want without the hassle of other maintenance. Save space. Boats take up a lot of space! Whether it’s in your garage, your yard, or in a place you’ve rented down by the water, finding a place to keep your boat when you’re not using it can be a hassle. Renting a boat enables you to keep your cars in the garage where they belong instead of being booted to the street! If you want to spend more time on the lake in Raleigh, North Carolina without the hassle of owning your own boat, check out Motor-Boatin LLC today! Mother’s Day is a great appreciation day for moms to show them extra love. Some moms will love a day on Falls Lake fishing and other would prefer a day on the jet skis. Plan something special for mom by going to Falls Lake. Enjoy a day filled with adventure and family bonding. People in Raleigh enjoy Falls Lake for its nature walks, boating, fishing, and picnic possibilities. Motor Boatin’ has some activity ideas for those who want to plan a memorable Mother’s Day in Raleigh. E njoy nature: Raleigh has many parks to enjoy, but Falls Lake is a local favorite. Take a walk through the trails and sit by the lakeside. Give mom the gift of a relaxing day while being outdoors. Don’t forget to take fun family photos to remember the day! Mom will love spending time with the family and the family will love a new adventure. Rent a boat: With pontoon and fishing boats, Motor Boatin’ has many boats for rental. Take a boat out and explore what the lake has to offer. Boat rental is a fun Mother’s Day activity for the whole family. Enjoy nature while on the lake and feel the calmness of the waters. Make a day of it by bringing food while on a sunset cruise. Plan a picnic: After taking part in a nature walk or boat ride, have a picnic by the lake. Catch up with the family over carry out food from mom’s favorite restaurant. Mothers will love the together time as well as the thoughtfulness of remembering her favorite things. 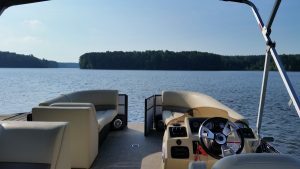 Motor Boatin’ loves providing fishing boat rentals so that Raleigh residents can enjoy Falls Lake. Consider planning a day at the lake for Mother’s Day with a fun boat ride. Contact Motor Boatin’ today to schedule a boat rental for Mother’s Day. Spring is a great time to rent a boat in the Raleigh area. Sunny skies and comfortable temperatures make the time on the water great for everyone. 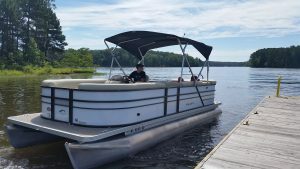 Motor Boatin’ has boat rentals for those who want to enjoy Falls Lake and all the activities it has to offer. Weather and nature: There is evidence that spending time in the sunshine and in a nature setting improves peoples’ moods. Rent a boat with friends or with family and spend some time in Raleigh’s outdoors on Falls Lake. Check out the nature around the lake with its flowers and colors during the springtime. Also, designating a fun activity such as a boat rental gives people something to look forward to throughout the week. Relaxation: Many of us do not get the relaxation time we need throughout the work week. Take a break from thinking about work and business by spending time on Falls Lake. Water is known to give people a calming effect. Enjoy spending time with friends and catching up on their lives while also relieving stress. Lunch or dinner date: Bring a picnic lunch or carryout dinner from a local Triangle eatery to share with others while floating along the lake. Grabbing lunch/dinner is always fun, but why not change it up and have lunch/dinner on a boat. Spontaneous activity: Is the same old pastimes getting boring? Try renting a boat and exploring Falls Lake with family and friends. With scenic views, there is always good photo opportunities. Motor Boatin’ believes that renting a boat will become a new reoccurring activity for family and friends. Birthday or anniversary party: Rent a boat for a family or friend’s birthday or to celebrate an anniversary. Bring all the party favors and have fun on Falls Lake. Enjoy a sunset cruise for an anniversary dinner and spend time with a significant other. Renting a boat is a wonderful, fun activity to do during the springtime in the Raleigh area. For more information on boat rentals on Falls Lake, NC, contact Motor Boatin’. Spring is here and warmer weather is on the way. Time to get the boats ready for the season with some spring cleaning tips from Motor Boatin’. Our boats are always kept up to a high standard of cleanliness and safety regulated for boat rentals. Boat upholstery: Use the right type of brush to address stubborn dirt. Do research on the best cleaners for each type of upholstery. Using the correct materials helps shorten the cleaning process while also making sure the cleaner used is not causing damage. Windshields: Use window cleaning solution with a soft cloth to clean off window stains. The cloth helps to prevent streaks. Clean windshields when it is cooler outside and the windshield is out of direct sunlight. Deck: Use a hose and a boat cleaning solution for the boat deck. Measure out the correct proportion of water to cleaner. Use a brush to get difficult dried on dirt and stains out. Exteriors: Use a hose with a nozzle that propels more water over a larger surface, but it is NOT a pressure/power washer. If it is the type of hose that already mixes in the cleaner, measure out the proportions correctly. Use buckets with a water and cleaning solution and a sponge to get to harder to clean spots. Rinse throughout the process to prevent the sun from drying the cleaner’s solvents onto the boat. Use soft and absorbent towels to dry off the boat. Use the appropriate wax and wax amount to seal the boat against the sun’s rays and water’s corrosive properties. As always, it is good to have a cleaning kit on board for messes and spills. Keep some cleaning wipes, window cleaner, paper towels, and cloths for quick fixes. For more tips on keeping boats clean and ready for spring, contact Motor Boatin’.